Rye flour type 1800, wholegrain Ash content of 1.77 - 2.2 %. Coarse whole grain rye flour. Recommended for diet dark bread. Rye flour type 997 Ash content of 0.9 to 1.1%. Produced from pure rye, without addition of other cereals. Ideal for kneaded breads. .
Rye flour type 997 Ash content of 0.9 to 1.1%. Produced from pure rye, without addition of other cereals. Ideal for kneaded breads. Rye flour type 1150 Ash content of 1.05-1.25 %. The appropriate formula for the production of rye bread. ... flavored crust that comes from germ wheat. Suitable for bread diet. Barley flour The low percentage of fat gives us a healthy, tasty breads, pastries suitable for diet and for the production of crisps. Rugmel - Rye wholemeal Coarse rye flour, wholemeal rye bread with low fat and gluten. Recommended for people with obesity and diabetes. Ideal for bread diet. ... be used as an adjunct to various types of delicious breads that are necessary for everyday healthy diet rich body. ... that are necessary to maintain a healthy diet for your body everyday. Regina - Super Toast Special fortified with gluten flour cat. Deluxe, originated from special soft wheat varieties. Ultra Strong t.55% Strong flour suitable for the industrial production of puff pastry, corn, peynirli, donuts and more. It can be used for mixing in many recipes for improvement. Organic Wholegrain flour Suitable for organic wholegrain bread. Regina - Super Toast Special fortified with gluten flour cat. Deluxe, originated from special soft wheat varieties. .
Panifico-For delicious Italian bread Panifico makes it easy and fast to produce a wide range of Italian bread. The result is guaranteed, every time. Ultra Strong t. 55% Strong flour suitable for the industrial production of puff pastry, corn, peynirli, donuts and more. It can be used for mixing in many recipes for improvement. Oats flour A study published in September 2003 by a group of U.S. doctors showed that consumption of foods high in fiber such as oats, helps prevent heart disease. Organic flour t.550 Suitable for organic bread. Organic flour type M For organic rustic yellow bread. Organic Wholegrain type M For organic wholegrain bread flour produced from organic durum wheat. Organic Rustic bread mix Wonderful light rye bread with flavor, contains 20% rye. With fine core structure you can make a great variety of organic kaning goods. La familia pizza - flour for pizza High quality, with fine granulation, perfect for production of tasty and fluffy crust. Suitable for a pizza left in maintenance. 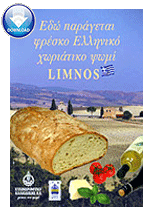 Fioreto-phyllo Strong flour suitable for the production of pizza fluffy peynirli industrial pastry croissants donuts fluffy pastry etc. NTEMI - flour t. 70% - No 2 Flour specially made for high-speed mixers because of its endurance and great output. Easy to work with and has good water absorption. Decor Topping: Flakes & Seeds Mixture of cereal flakes for the decoration of breads and the production of special types of breads (multigrain). Oats, rye, sunflower, linseed.